If your doctor or surgeon acted negligently or an error resulted in the need for you to seek additional care to treat your injuries or repair damage to internal organs, you have the right to file a lawsuit for malpractice. The Naperville medical malpractice attorneys of Rosenfeld Injury Lawyers LLC fight tirelessly to ensure that every one of our clients receives the compensation they are entitled to for the cost of their medical treatment and associated costs. We’ve provided the following information on Naperville’s hospitals and surgical centers to highlight what may contribute to a malpractice claim. Contact the Naperville medical malpractice attorneys at Rosenfeld Injury Lawyers LLC for a Free Review of your legal rights and options. We are ready to serve you and your family. The median family income for a family living in Naperville is over $130,000 and Naperville is one of the most affluent cities in the nation. Its residents can afford and demand the highest quality care when the need arises for emergency care or outpatient procedures. Naperville’s Edward Hospital is also the city’s largest employer— offering 4,288 jobs to those seeking careers in the medical field. The city’s large population and access to only one hospital requires that some residents seek care from nearby cities, however. Surgeons and their staff members receive many years of training to prepare them prior to allowing them to perform work that risks the wellbeing of their patients, but they still make mistakes from time to time. Facilities and physicians are insured in the event that they must pay malpractice claims for this reason and many patients who have been injured because of a medical error are not aware of their right to bring a claim. The following forms of malpractice are the most common, but if you have been injured in any way at all, it is advisable to seek the opinion of a Naperville medical malpractice attorney. Surgical errors. During a surgical procedure, it is not uncommon for the surgeon to damage internal organs on accident by making an incision in the wrong location. Many of these errors can be repaired if noticed and fixed during the procedure. In the event that the error occurs and is not repaired, complications can arise which include the infection at the incision site, extreme pain and internal bleeding. Medication errors. During a hospital visit, it is possible to be prescribed or administered the wrong medication or an incorrect dosage. Depending on the medication or the dose, this can have very serious consequences, including heart failure, internal bleeding or death. Improper diagnosis. There have been instances in which your doctor may have failed to properly diagnosis your condition, requiring you to undergo improper treatment or surgical procedures. Medical device error. From time to time, the devices used during medical procedures are later found to have negative impacts on patients’ health. Below you will find the latest information about the facilities that serve most of Naperville’s population, both so that you can make informed decisions about where to seek care and to determine whether the facility you received care from has a history of providing substandard care. When building a malpractice case, this information can be used to argue that the hospital staff had not taken proper safety measures prior to your injuries if there is a pattern of questionable behavior. Edward Hospital is one of the most respected hospitals in the area and is designated by the state as a level two trauma center, level three perinatal care facility and pediatric critical care center capable of providing emergency care for children as well as adults. The majority of its patients pay for care through private insurance and 80% of patients have stated that they would recommend this hospital to their friends and families. Its readmission and thirty day mortality rates are well below the state and national average. 16% of patients suffering from pneumonia were readmitted with a 9.9% mortality rate while 16.8% of heart attack patients required readmission. 12.4% of the facility’s heart attack patients died within thirty days. Issues brought up in patient surveys were that the environment was not always keep sanitary and that patients’ treatments were not always explained in a manner which could be understood. Only 53% of patients understood their treatment and 30% had complaints about the cleanliness of their beds and bathrooms. Unsanitary conditions can result in the spread of infections and other communicable diseases. Good Samaritan is a level one trauma center that offers level three perinatal care and emergency pediatric care. Its inpatient insurance mix is almost equally divided between private insurance and Medicare payments and its readmission and mortality rates are slightly higher than Edward Hospital’s. 12.3% of pneumonia patients, 11% of heart failure patients and 16.4% of heart attack patients died within 30 days of initial treatment. These figures are still lower than the national and state averages. Cleanliness was listed as an area of concern here as well, with 24% of patients reporting that they did not feel their beds and bathrooms were kept sanitary. Additionally, only 55% of patients stated that they understood their treatment and diagnosis prior to being discharged. 88% of patients were given information about their home recovery, so what this suggests is that the information was confusing or unclear and did not help patients understand what to do to aid their recovery after being discharged. Northwestern Medicine Central DuPage Hospital, known more commonly as Central DuPage, provides care throughout Winfield as well as to residents living in the north part of Naperville. Central DuPage Hospital is a state designated level two trauma center, pediatric critical care center and offers level three perinatal care. While 82% of its patients have stated they are highly satisfied with their treatment, this facility does have mortality rates which are higher than both the state and national averages. About 12.5% of those treated for pneumonia, 12.5% of those treated for heart failure and 15.5% of heart attack patients died within thirty days of treatment. 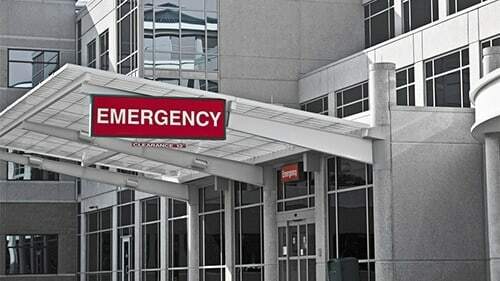 These rates resemble Central DuPage Hospital’s readmission rates of 16.5%, 19.9% and 17.7%, respectively, which exhibits a close connection between readmission and mortality. This facility can make improvements to ensure that patients are completely healthy prior to discharge in order to prevent them from being readmitted. This facility also only scored 91% for its blood clot care, meaning that 9% of patients with blood clots did not receive effective treatment for their conditions. 13% of patients developed blood clots while under the care of this facility and did not receive treatment which would have prevented them. Adventist Bolingbrook offers service primarily to the Bolingbrook and Romeoville areas but many residents living in Naperville’s southeastern most communities are within its reach. The facility suffers from a poor satisfaction rating compared to others in the area and a much higher readmission rate. Long wait times, failure to educate patients about their treatment and cleanliness concerns have all resulted in a 69% patient recommendation rate. 19.7% of patients treated for pneumonia, 22.6% of patients experiencing heart failure and 18.8% of heart attack patients returned within thirty days of discharge. One in five patients seeking treatment for these serious concerns ended up returning to the hospital. Luckily, Adventist Bolingbrook’s mortality rates are lower than the state average and about half of patients readmitted with pneumonia or heart failure survive. Heart attack patients are not so lucky— 15.2% die within thirty days of discharge. Many victims of medical negligence remain silent or decide not to pursue cases because they are not aware of what constitutes medical malpractice under Illinois law. In order to win these types of cases, you must establish that your physician breached his duty of care and acted in a manner contrary to how his or her peers might have in a similar situation. If you suffered any injury due to routine care or a surgical procedure, you should consult with one of the Naperville medical malpractice lawyers of Rosenfeld Injury Lawyers LLC for a free case review. Our attorneys have secured verdicts in favor of thousands of clients who have been injured or killed due to medical errors and can determine whether your doctor acted negligently. After we’ve had the opportunity to review your case, we will let you know what legal options are available and whether you should pursue a case. We work on a contingency basis, so at no point will you need to worry about providing payment unless we are able to secure compensation on your behalf.